As I mentioned last week I initially wanted to thump this report out with brevity hitherto not seen but it grew and soon turned into a two part marathon. Last week I covered the bottom half of the NRL competition in Part 1. This week I deal with the top 8. Given the report straddled two weeks, references (competition positions, points and points differential) comments and opinions are taken after round 8 and don’t take into consideration last weekend’s games. Injuries, poor form and controversy dogged (excuse the pun, it wasn’t deliberate) Canterbury during the 2013 season but all of that is a distant memory as the Doggies find themselves on the top of the ladder. There wasn’t a lot of early season buzz about the Dogs but they are often there and thereabouts and they have a forward pack that can’t be ignored. They have been willing but not necessarily polished in the first trimester with marquee wins over early season favourites the Storm, Roosters and Rabbitohs. In addition, their two losses have been narrow ones to the Broncos and the Panthers. Josh Reynolds – He is the gift that keeps on giving. Not highly touted when he arrived on the scene and not as fancied as other high profile halves but his grittiness and ability to turn up at the right end of the match is helping them no end. The Bulldogs are well set at this stage of the competition. They are unlikely to lose that many players for State of Origin primarily on account of international players (4) and the fact that their higher performing players are in hotly contested rep positions and not necessarily at the top of the pecking order (Josh Reynolds, Michael Ennis and Tony Williams). In fact only Josh Morris is a certainty. They are relatively injury free with only Frank Pritchard a long term concern. That being said they don’t have a lot of depth. They are well placed for the balance of the season and should push for a top four position, provided their key players don’t get bitten by the injury bug. The Sea Eagles turn up year after year with a consistent approach and the first trimester was no exception to this rule. Manly have had to repeatedly deal with injuries to key players (Kieran Foran, DCE, the Stewart brothers and Jorge Taufua have all missed time due to injury) in the first 8 rounds but have still found a way to get across the line on most occasions with their only losses against Melbourne and the improved Tigers. At times they have looked lacklustre (as against the Eels) but at other times they have looked invincible (as against the Raiders). Their halves have been outstanding and they have had the opportunity to test their depth, for instance, unearthing Peta Hiku as a fair replacement. DCE – I refuse to call this man by his full name. He is that good. He makes Manly better in so many ways and together with Kieran Foran forms the most potent halves combination in the NRL. Enough said. The next trimester (AKA rep season) will be pretty tricky to navigate for Manly. They are going to be missing Kieran Foran, Glenn Stewart and Jamie Lyon due to injury for part or all of that time and possibly DCE, Brett Stewart, Jorge Taufua and Anthony Watmough for Origin duty. How they aim up in the next trimester could determine whether they are top 4 or in the bottom half of the top 8, especially given how close the competition is at the moment. History shows that they should maintain consistency and end up in the top 4. Worst case scenario is they drop to the bottom half of the 8 under the weight of continuing injuries. The Titans are so underrated they are overrated. They seem to have risen from the ashes of abysmal campaigns in 2011 and 2012 after showing promising signs in 2013. Apart from a hot weather shellacking from the Tigers they have been hanging with teams all season and even winning away from home (4-1 away record). Greg Bird has been playing the house down. Aiden Sezer and Albert Kelly provide stability and creativity (at the same time) that the Titans have been looking for in the halves for some time. David Mead has been a highlight as well. Greg Bird – Has hit the ground running this year and provides the effort and mongrel a team like the Titans need to make an impact on the competition (all the Warriors fans are nodding). It is a cliché but sometimes it’s the size of the fight in the dog and not the size of the dog in the fight that matters most. He does enough on the edge to keep teams on their toes as well. I thought that the Titans would incrementally improve this year as Albert Kelly and Aiden Sezer are a year or two from really hitting their straps but they have surprised most and after round 8 are on the same points as the Bulldogs and the Sea Eagles perched on top of the ladder. The next 8 weeks should show whether the Titans are on a steeper trajectory (than initially predicted) or not. The competition is on a knife edge so maintaining the early season effort across the balance of the season when the desperation levels of other teams rise will be crucial. They have no-one on the long term injury list and look to lose only Greg Bird and Nate Myles as certainties for Origin, although David Taylor, David Mead, Kevin Gordon and Ashley Harrison will all figure in the selector’s discussions, no doubt. They are well placed for the 8 but will have plenty of competition for the top spots on the ladder. Along with the Eels, the Tigers have been the surprise packets of the season. With only the premiership in 2005 to show for the strong squads of the last 10 years the Tigers decided to clean house. Over the last few seasons Management have offloaded Tim Sheens, Benji Marshall, Andrew Fifita, Beau Ryan, Blake Ayshford, Chris Heighington and Bryce Gibbs. Pretty much the only player remaining from that era is Robbie Farah. Replacing them is a generation of especially talented juniors like Luke Brooks, James Tedesco, Aaron Woods, Tim Simona and Curtis Sironen. Everyone expected that eventually the Tigers may become competitive in a few seasons. Many (including myself) expected them to experience growing pains of the highest degree. They were my pick for the spoon. They have certainly exceeded expectations. They play an exciting brand of football mainly due to Brooks, Tedesco and Simona and they have shown the requisite mongrel through Woods, Martin Taupau, James Gavet and an improved Adam Blair. Mick Potter will be pleased with their First Trimester Report Card. 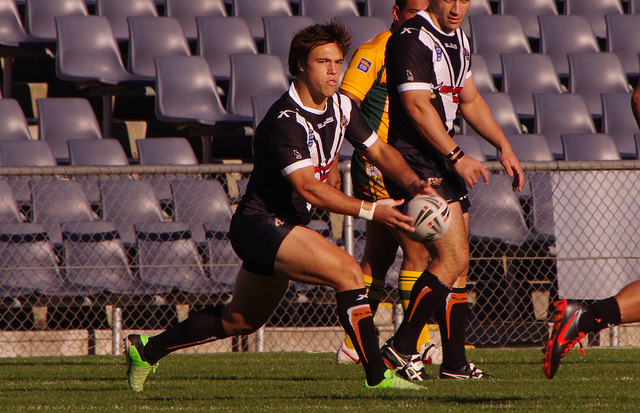 Luke Brooks – He was touted as a star of the future and has hit the ground running. He is missing James Tedesco at the moment as he has an other-worldly understanding with his young compatriot but is still one of the brightest young stars of the competition. Honourable mention to Aaron Woods who leads the Dally M votes for the Tigers. He has been an irrepressible force of nature but I had to give this one to Brooks by a nose. It is probably all downhill from here. Firstly, they won’t be sneaking up on anybody anymore. They have the longest injury list of all the teams in the NRL with Curtis Sironen, Tim Moltzen, Dene Halatau, Sauaso Sue, James Tedesco, Brad Tighe and James Gavet all currently out with a range of injuries. The only definite representative absence will be Robbie Farah (if fit) but surely Aaron Woods and Keith Galloway are on the radar as well. Given the close nature of the competition and their long injury list missing out on the 8 is a real risk for this team. If they do manage to sneak into the 8, they would have exceeded all expectations for this season. Next season they will be even better. It is fair to say that the Roosters have underachieved so far this season. Given no team has been repeat premiers since 1997/1998 (the Broncos with one NRL title and a Superleague title) and 1992/1993 (the Broncos in the ARL) it gives an indication in this salary cap era of how hard it is to repeat. They started off with a bang dominating Wigan in the World Club Challenge but came quickly back to earth in the first round against Souths. They have been up and down ever since. Wins have not been that convincing except for the drubbing of the Eels and the team hasn’t really clicked with any sense of consistency. They have been good in patches. Boyd Cordner – No-one has really stood out for the Roosters, however, Cordner has been as good as anyone. Though not as fancied as his three lettered colleague, Cordner has improved in leaps and bounds since arriving on the scene in 2011 and still has his best years ahead of him at only 21 years of age. The Roosters could lose up to 6 players for the upcoming rep season. That aside they have the talent (and a deep reservoir of NZ players, which helps during Origin) to comfortably weather the rest of the season if their heart is in it. Every week will be a challenge for them as defending premiers but they should have the talent to hit the top 4 and make some real finals noise come September. SBW will be moving back to Rugby Union as well in 2015 which should provide some motivation for the team as well. The Broncos have exceeded expectations but find themselves with not too much to show for it. This is primarily because all of their losses (up to and including round 8) have been between 2 and 7 points and have been of the last minute variety. In fact with a bit of luck and some better execution in the final ten minutes they could be undefeated and on top of the ladder. Led by their test level back row, outstanding centres and improving halves they have competed admirably in the season so far. Ben Barba has incrementally improved as the season progressed but is still not hitting the form of 2012. Ben Hunt – Most of the playmaking pressure has fallen on his young shoulders and his maturation process has continued from his improved play at the back end of 2013. He is an effective runner of the ball and is improving week on week in terms of his ball playing skills. He has been the best on park for the Broncos in quite a few of the games already this season. Before the season started I thought the distinct absence of ball playing halves would cripple the Broncos and I haven’t totally abandoned that idea. Ben Hunt is exceeding expectations but there isn’t a lot of ball playing support around him. Andrew McCullough is in the honest toiler category (though individually strong near the try line), Ben Barba is still to hit his straps, Josh Hoffman has the odd pass in his arsenal but is predominantly a ball runner and the back rowers are generally ball runners rather than in the Glenn Stewart/Luke Lewis mould (though Corey Parker is an offloading machine). The Broncos will be heavily taxed during the Origin series though not as heavily taxed as in seasons past. I figure that they will lose Justin Hodges, Josh McGuire, Corey Parker, Matt Gillett and Sam Thaiday but gone are the days of the Baby Broncos. With the crush of teams in and around the top 8 the Broncos will be doing well to make the 8. Having said that I think making the 8 will have been playing above expectations for this team. After game 1 (a flogging of the Roosters) it looked like no-one would stop the Rabbitohs this season. How wrong we were! With the talent and depth this team has, much was expected. Sometimes the weight of expectation weighs heavily on a team, however, I think it seems more likely that the Rabbitohs started reading their own press. They have been anything but consistent and have yet to really hit their stride (up to and including round 8). Teams have designed a game plan around unsettling the Burgess brothers. Once that has occurred it seems that their all star back line is partially nullified. Souths have had convincing wins against the Roosters and the Dragons, however, they were beaten by the Sea Eagles, Bulldogs, Raiders and Tigers. Nathan Merritt has been dropped and after losing Luke Keary in the pre-season Michael Maguire is yet to really settle on a halves partner for Adam Reynolds having tried Dylan Walker and John Sutton interchangeably so far this year. Sam Burgess – the man mountain has been a colossus this season and when he goes well generally the whole pack follows him. He will be sorely missed next year. The Rabbitohs can still live up to their top billing. They have definitely underachieved but in this close competition can still use this as a base for bigger and better things. They will definitely lose Greg Inglis during the State of Origin but could also lose Adam Reynolds, John Sutton, Chris McQueen and Ben Te’o depending on how selections play out. There is a lot to be said for populating your top 17 with international stars like the Burgess brothers and Isaac Luke. Speaking of Isaac Luke, they can expect him back mid-season along with Luke Keary and that is the sum total of the Bunnies injury list. Hopefully for Bunnies fans all complacency has disappeared. The Panthers started their rebuilding programme under Gus Gould in 2011 and this is the third season since he became associated with the club again. They weren’t highly touted in the pre-season despite making some astute acquisitions in Elijah Taylor, Jamal Idris, Peter Wallace, Jamie Soward and Brent Kite, all who are known quantities. Perhaps the buy of the season might end up being Tyrone Peachey who has played himself into a permanent role in the 17. Most pundits expected incremental improvement with real improvement to come when their highly touted junior nursery hit their straps (similar to the Tigers). They have had some uplifting wins (Bulldogs and Titans) but have had their share of depressing losses as well (Sharks and Eels). Predominantly they have flown under the radar. Peter Wallace – Back at home in the foot of the mountains, Peter Wallace has had a solid start to the season for Penrith. No longer in the long shadow cast by Darren Lockyer, Wallace has been effective for the Panthers and is at the centre of a lot of the good things happening out west. I expect them to continue to fly under the radar. Well placed to slip into the 8, they could really benefit from the Origin period. They have no certain Origin selections in their side with Tim Grant, Jamal Idris, Peter Wallace and Jamie Soward all having played before but are behind other candidates. They also have impressive depth due in part to their star studded Holden Cup team (last year’s premiers). They have a number of key players out at the moment but the majority of them are due to come back in the next few rounds (Wes Naiqama, Lewis Brown, Sam McKendry, Elijah Taylor and Tim Grant). I think they are tracking well against their five year plan. 30,097 members and counting. Well done Souths. Michael Morgan and Robert Lui. Finally some support for JT. The Hayne plane. It is amazing how well he can play when he isn’t hobbled by injuries. Peta Hiku was a great get for the Sea Eagles. He has plugged every hole in the back line they have had so far. He is a keeper. Roosters and Rabbitohs lifting or just another round of inconsistency? The Bulldogs are gaining momentum. Many of their early season wins were nail biters but this one was dominant. The Storm and Sea Eagles for putting on an epic game. Either team could have won that game till the very last second. The NFL Draft. I think the Draft would be a masterstroke for League. I understand the argument against a draft (teams would stop developing talent and may be subject to legal challenge) but couldn’t both of these issues be successfully navigated? The NFL Draft created acres and acres of analysis and generated so much buzz and it covers that dead spot in the middle of the off season. I think a draft would be a win-win for everyone. Dante Exum – Creating some serious excitement as the NBA Draft sneaks up on us. Early mail is that he will be in the top 5. He will rise and fall depending on workouts in the coming weeks. Exciting times. PNG Hunters – Chalk up another win for the boys from Kalabond Oval. This one moves them into outright third position on the ladder. The Raiders. They have a lot of talent but they were absolutely creamed by the Warriors last weekend to go with the hiding Manly gave them in round 8. Troubling times for Ricky Stuart. Benji the Dragon. I think this is a better position for him than the Sharks. Still think that the Storm was the best situation for him. I expect to see him running out against the Eels on Saturday afternoon. Quite surprised to see the Warriors lock up their head coaching position for the next three years with Andrew McFadden. Thought they might put the job up for interview at the end of the season. Some are suggesting McFadden was always the long term candidate anyway. Konrad Hurrell – Run Metres – 209m, Tries – 1, Try Assists – 1, Tackle Breaks – 11, Tackles – 11, Offloads – 0, Line Breaks – 3, Errors – 1 and NRL Players that have put weight issues and miscellaneous scandals behind them in the same season – 1. Season so far – 37/72. Wow, finally hit 0.500. The Tigers, Eels, Titans and Dragons were the surprise packets for the first trimester of the season. Who do you think will surprise in the second trimester? This entry was tagged Australia, Basketball, NBA, NBA Draft, New Zealand, New Zealand Warriors, NFL, NFL Draft, NRL, PNG, PNG Hunters, Queensland Cup, Rugby League. Bookmark the permalink.